Ryan, McConnell turn down White House invitation due to scheduling conflicts. 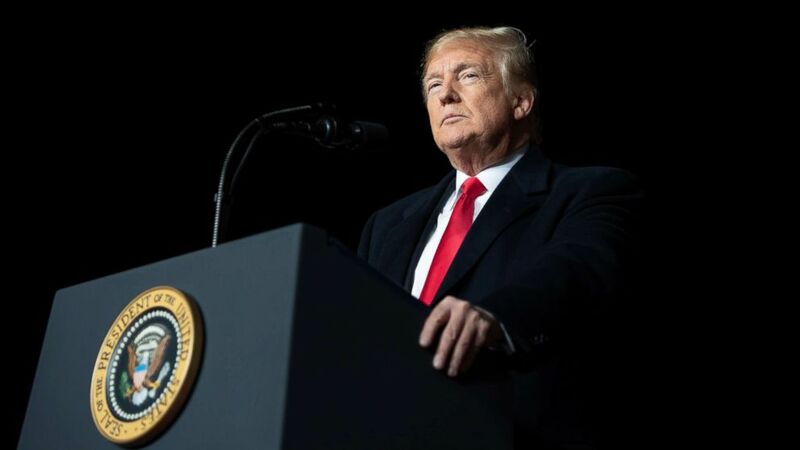 Several top congressional leaders from both parties passed on an invitation from the White House to join President Donald Trump on his visit to Pittsburgh on Tuesday in the wake of the shooting at the Tree of Life synagogue, according to several sources familiar with the matter. With the midterm elections just one week away, Senate Majority Leader Mitch McConnell and House Speaker Paul Ryan are unable to make the trip because of scheduling conflicts. Senate Minority Leader Chuck Schumer and House Minority Leader Nancy Pelosi declined the invitation, according to aides to both Democrats. (Saul Loeb/AFP/Getty Images) President Donald Trump speaks during a campaign rally at Central Wisconsin Airport in Mosinee, Wis., Oct. 24, 2018. The White House has not responded to ABC News' request for comment. Also not expected to appear with Trump despite being invited: Republican Sen. Pat Toomey of Pennsylvania. "Senator Toomey attended a vigil, met with law enforcement, and leaders of Pittsburgh's Jewish community this past weekend and yesterday. Today, Senator Toomey will be attending to prescheduled commitments in southeast Pennsylvania," Toomey's spokesman Steve Kelly told ABC News. Eleven worshippers, including a 97-year-old woman, were gunned down inside the Tree of Life synagogue in Pittsburgh's Squirrel Hill neighborhood Saturday morning. Both Ryan's and McConnell's press teams dismissed the characterization that they outright declined the invitation to appear alongside Trump. "He was unable to attend due to long-planned events in Kentucky. He did, however, speak to the shootings at two different events yesterday," a spokesman for McConnell told ABC News. "He did not “decline” or “turn down” the invitation." (Chip Somodevilla/Getty Images) Senate Majority Leader Mitch McConnell talks to reporters after the Senate voted to confirm Supreme Court nominee Judge Brett Kavanaugh at the U.S. Capitol, Oct. 6, 2018, in Washington, DC. A Ryan aide told ABC News that the speaker is on the campaign trail stumping on behalf of Rep. Andy Barr in Kentucky today. “We weren’t able to make it on the short notice,” Ryan's press secretary AshLee Strong told ABC News. On Monday, McConnell spoke out about turning the "temperature" down on the heated rhetoric and tone in light of two shootings, one in Louisville, and the other in Pittsburgh, both of which he called hate crimes. "We witnessed two horrendous shootings. Two people were killed at a Kroger store in Louisville and there was a mass assassination at a synagogue in Pittsburgh. If these aren’t hate crimes, I don’t know what the definition of a hate crime is. Obviously, they were. I don’t know what’s going on in our country, you know, periodically we’ve had these kinds of outbreaks by deranged people but it certainly gets your attention that the whole rhetoric and tone, it seems to me, is a lot hotter than it ought to be. 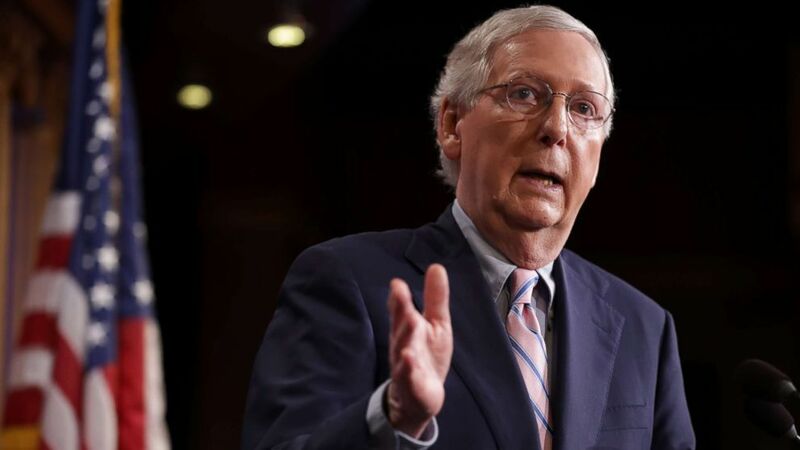 And I don’t case that blame on one side or the other, but just collectively it seems to me that we have to turn the temperature down here," McConnell said. He went on: "And I hope after the election’s over – elections tend to ratchet up all this anyway. And the rhetoric before every election is a lot hotter than it is normal. Then you have mixed in with these horrendous criminal activities, it has a lot of people on edge and I wanted to add my voice to those of others who say we need to turn the tone down here."